Busy times for Percy Jackson. 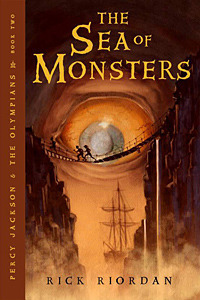 A year after his first summer camp experiences he returns to Camp Half-Blood only to find that his friend Grover, who went on a quest to find the long-lost nature god Pan, has been taken captive by the Cyclops Polyphemus, and that the Camp is about to be attacked by the Titan’s army, unless they find the Golden Fleece to protect it again. And fail without friends, to fly home alone. Over the year, Percy has made a new friend in Tyson, a homeless kid who later turns out to be a cyclops, and therefore, his half-brother. (Since Poseidon is the father of all Cyclops… oh well.) After being attacked by Laestrygonian giants, Percy, Annabeth and Tyson escape to Camp Half-Blood. But Percy gets to Camp Half-Blood, he sees Thalia’s tree has been poisoned. Now, if you’re completely lost: Thalia was Zeus’ daughter, who wasn’t supposed to live and nearly died and then got turned into a tree that magically protects the camp. Sounds like fun, right? Anyway, the tree is poisoned so now monsters can enter the camp whenever they want to. Percy also starts having dreams about his friend Grover, who went on a quest to look for Pan, and finds out that Grover is in fact taken captive by the Cyclops Polyphemus, and wants to save him. Hermes, who shows up on the beach in the middle of the night, tells Percy that we has to invade Luke’s cruiseship of monsters, gives him a few handy gifts, and sends him, Tyson and Annabeth off on a quest of their own. Cross paths with Hydra, an evil monsters with more heads than good for it. They also meet up with Clarisse – which, though it was by accident, turns out to be a good thing when she slays Hydra. All of them sail into the Sea of Monsters, which is now the Bermudez Triangle, on Clarisse’s ship of bones sent by her father, Ares. But when they have to choose between Skylla and Charybis, the ship explodes in the fight. Percy and Annabeth end up on Circe’s island, but though Percy gets turned into a guiny pig for a while, get away without any real harm done. And when they come across the Sirens, Percy saves Annabeth from them. Get imprisoned, yet again, by Luke on his cruise ship. They find out that Luke was the one who poisoned Thalia’s tree, and nearly lose the fight with him, until Chiron and some other centaurs show up to save them. The Fleece works its magic and the camp is magically protected again. However, the Fleece works a little too well, and instead of Thalia’s tree, they find Thalia lying on the ground, fully healed by the power of the Fleece. Phew. Olympians: The ruling Greek gods. Titans: Parents of the Olympians, who were defeated by the Olympians in the Titan war. They have been rotting in the Tartarus (the darkest place of the Underworld) since, and in this book it is revealed that their leader, Kronos, wants revenge. Camp Half-Blood: The secret summer camp / training facility where demigods go to train for fighting monsters. Centaur: Half human, half horse. Example: Chiron. Demigod (or hero): Half human, half Greek god. Satyr: Half human, half goat. Example: Grover. Iris message: A message communicated via rainbows between gods or demigods. The Mist: A magical “cloud” that keeps humans from seeing what’s really there. For example, when humans would come near Camp Half-Blood, they would see nothing.